"The Business of Life is Not a Life of Business." Yes, it's true. The business of life is not a life of business. And only when you realize that, will your business (and your life) really flourish. Research has shown that business people are more creative when they are happy. Indeed, a positive mood is one of the precursors to a culture of innovation. If you are a manager, entrepreneur, or simply someone who gets absorbed in their work, you would be well-served to create more balance in your life. All work and no play not only makes Jack a dull boy, it screws up marriages, friendships, health, parenting, and ultimately the workplace environment. Any thing specific you can do this week to walk the talk? Idea Champions is happy to announce the launching of DOING MORE WITH LESS -- the perfect, cost-effective intervention to help your company keep innovating (while cutting costs) during recessionary times. "How can we share information with suppliers, vendors, and customers in order to streamline our innovation process?" "How can we better predict market changes in order to increase our efficiencies?" "How can we better predict what products and services will succeed?" "How can we decrease re-work throughout our organization?" "How can we identify and eliminate all unnecessary activities?" "How can we consolidate common activities throughout the organization?" "How can we empower our customers to perform some of the tasks that are now the sole responsibility of our staff?" "How can we encourage our vendors and suppliers to become part of our product development process?" "How can we take advantage of the cost-cutting happening throughout our industry in order to be more competitive?" "How can we accomplish the same goals in half the time and half the cost?" "How can we discover the most elegant solutions to our most pressing business problems?" If you are a coach, manager, business leader, trainer, therapist, change agent, light bearer, or simply feel the need for some inspiration, log onto my interview with Lynn Kindler, of CoachingCommons.org next Thursday, May 22, 3:00 PM (EDT). 60 minutes worth. No commercials. No sales pitch. No quiz, afterwards. Just useful insights about how you can be a catalyst for innovation, creative thinking, and extraordinary results. If you missed Tim Gallwey's classic Inner Game of Tennis the first time around, now's your chance to get it. Tim's book, the best selling sports psychology book in U.S. publishing history, is about as good as it gets. Using tennis as a metaphor, Tim has found an impeccable way to help athletes and non-athletes alike go beyond their inner obstacles and tap into their innate potential as human beings. I'm speaking from experience, folks, because I worked with Tim for two years in the mid 1980's as part of his Inner Game corporation in LA. Tim doesn't just walk his talk, he lobs it, slams it, and puts just enough back spin on it to tease out the very best of his reader's and client's abilities. Oh... he also gave me a wonderful testimonial about my new book, Awake at the Wheel: "A superb catalyst for anyone with the urge to bring their best ideas to reality." Thanks, Tim! And thank all of you for making your effort to wake up and play the inner game of life. Many thanks to Chuck Frey, soulful Founder of www.innovationtools.com for his very kind review of my new book, Awake at the Wheel. For any of you who don't know Chuck, this man is a gem. And he's done an extraordinary job putting together what I think is the best innovation portal on the web. If you haven't been to his site yet, go visit. It's a wonderful resource -- articles, links, reviews, research, whitepapers, products, blog -- and all things innovative. We're all in this together, folks! I love this management development book by Erika Andersen. It's simple. It's beautifully written. And it's very useful. It's clear that Erika is talking from her real-world experience and not the jive zone of wannabee consultants. It's rare to find a business book devoid of gobbledygook. This book is that rare book. I thoroughly enjoyed the various ways in which Andersen coaches the reader through real-time challenges in the corporate workplace -- especially the art of hiring and listening. 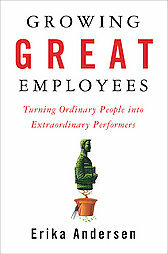 Growing Great Employees reminds me of what Michelangelo said when asked how he made the David. "I just took away everything that wasn't." It sure seems to me that the very talented Ms. Andersen has found that secret formula, taking away everything that didn't need to be in this book and leaving the reader with everything they need in order to understand what it means to manage people skillfully and with great humanity. OK. It's official. My new book, Awake at the Wheel, hit the bookstores yesterday. In celebration of its coming out, Wayne Hurlbert of BlogTalkRadio, did a 60 minute interview with me last night. Click here, if you want to listen. Click here if you don't want to listen. In either case, I hope things are clicking for you, no matter what you choose to do.